BPSC Jobs Circular 2018. BPSC Bangladesh Public Service Commission Jobs Circular 2017 apply completed. 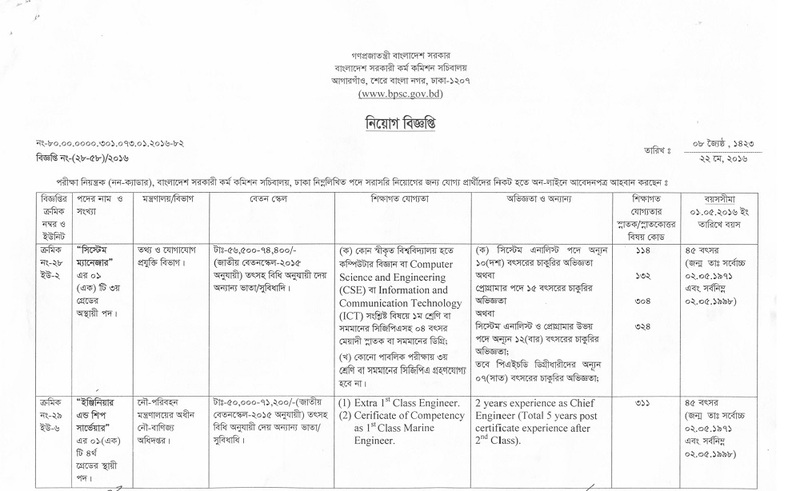 BPSC Non-Cader jobs circular has been published there official website and eduresultsbd.com. Recently they announce 121 Number of empty post this circular. We are given here all information for the BPSC Bangladesh Public Service Commission Jobs Circular 2018. Bangladesh Public Service Commission a constitutional body established primarily to recruit persons for various services and posts in the Bangladesh government. BPSC has first established two separate commissions, namely the Public Service Commission 1st, and the Public Service Commission 2nd, were initially established in May 1972 under provisions made in President’s Order No. 34 of 1972. How to apply this jobs circular. This jobs circular is published by bpsc we are given apply link for this job. At first, go to our applying link and click them then you got a form please fill up this and submit your cv. When these jobs admit will be published then we are given here this download option you can download you’re admit here.We also published this jobs exam Seat plane and result you can get your necessary information at this. Bangladesh Public Service Commission a constitutional body established primarily to recruit persons for various services and posts in the government. It is also involved in decision processes relating to other service matters such as promotion, posting, transfer, discipline, and appeal of the government servants. The main purpose of constituting such a body, designated in most countries of British heritage as ‘civil’ or ‘public’ service commission, is to ensure that all decisions relating to recruitment and other service matters are made consistent with the principles of merit and equity. In Bangladesh, this body is presently designated as the Bangladesh Public Service Commission (BPSC).